Desert Springs will host the fifth annual ‘Golf 4 All’ Pro-Am, to be played over the Championship Indiana course on the 4th and 5th January 2013. Desert Springs residents and touring professionals, Trish Johnson and Becky Brewerton will be joined by their colleagues from the Ladies European Tour for this unique Pro-Am Tournament. Played over two days, the event is open to both male and female amateurs, members and non-members of Desert Springs, with entries being accepted from individuals or in teams of three. The event begins with a welcome ‘Meet the Pros’ evening where the draw will be made for first round professional team captains, followed by an informal Spanish evening at the Crocodile Club. 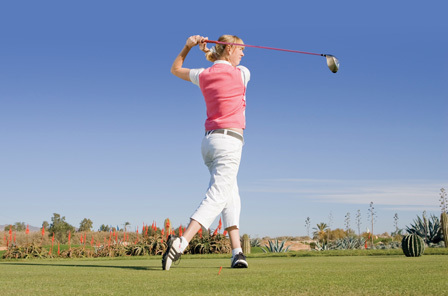 The Winner of the Golf 4 Women Winter Golf Festival will be entitled to choose their professional. The first round will be played in Texas Scramble format, with each team of 3 amateurs being led by a professional captain. After play, lunch will be held at El Torrente Restaurant followed by the draw for professionals for the second round, which will be a Fourball Team Stableford (best 2 stableford scores to count at each hole). On both days, the Lady Professionals will be hosting golf clinics in a relaxed and fun atmosphere at the Golf Academy. The prize giving presentation will take place at El Torrente Restaurant during the final evenings dinner. Prizes will be awarded for the best scores on each day with the overall winning team being the best aggregate Stableford score over the two rounds. The tournament entry fee is €414 for members and €484 for member guests, extra places can be booked for the meals and social functions for non playing guests. There is also a package for visitors wishing to stay at the Resort. Don’t miss this excellent opportunity to see the ladies of the European Tour and to play alongside some of the best players in the women’s game. Contact José Ignacio Olea to secure your place.